•	Familiarity with the SUSE, Red Hat, or Ubuntu operating system and networking. •	Familiarity with the SQL language. •	Why is SQL Server on Linux? •	Deploy and configure SQL Server 2017 on Ubuntu servers. •	Deploy and configure SQL Server 2017 on SUSE servers. •	Deploy and configure SQL Server 201y in Red Hat servers. •	Pull and run a SQL Server 2017 image in a Docker Container. 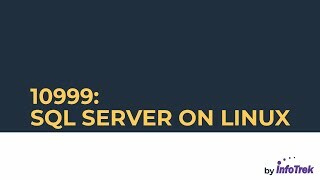 •	Install SQL Server Agent on RHEL, SLES, and Ubuntu. •	Install SQL Server Full-Text Search on RHEL, SLES, and Ubuntu. •	Install SQL Server Integration Services on RHEL and Ubuntu. •	Move SQL Server databases with backup and restore. •	Move SQL Server databases with database import and export. •	Use SQL Server Migration Assistant to import databases from other RDBMS platforms to SQL Server. •	Use the Bulk Copy Program to import and export data. •	Use SQL Server Integration Services to import and export data.